Iona and Travis are Fun In the Sun Weddings’ newest newlyweds! This bride and groom are the perfect epitomai of the Millenial couple, from how they met to how they got married. Iona and Travis met in a way that defines their generation. They found each other online, and then set their first meeting at Starbucks! They clicked right away, with so much in common that they walked and talked for hours. And the rest is history! 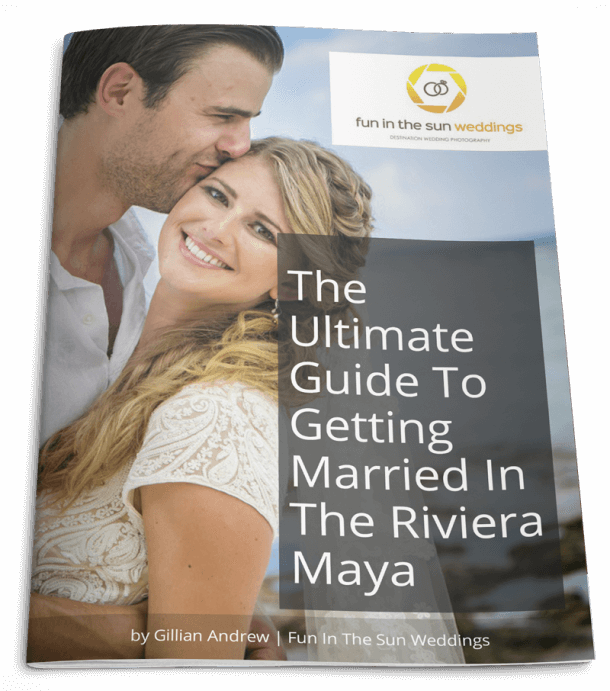 Travis used their vacation to the Hotel Riu Cancun as the perfect time to propose to Iona. He was so nervous that as soon as they checked in, he took Iona to the balcony and proposed to her with ring box upside down! 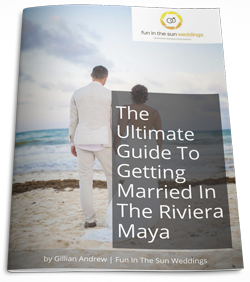 That romantic Cancun vacation was one of the best trips of their lives, and so they decided Hotel Riu Cancun was also the best place to bring their loved ones to celebrate at a beach wedding. 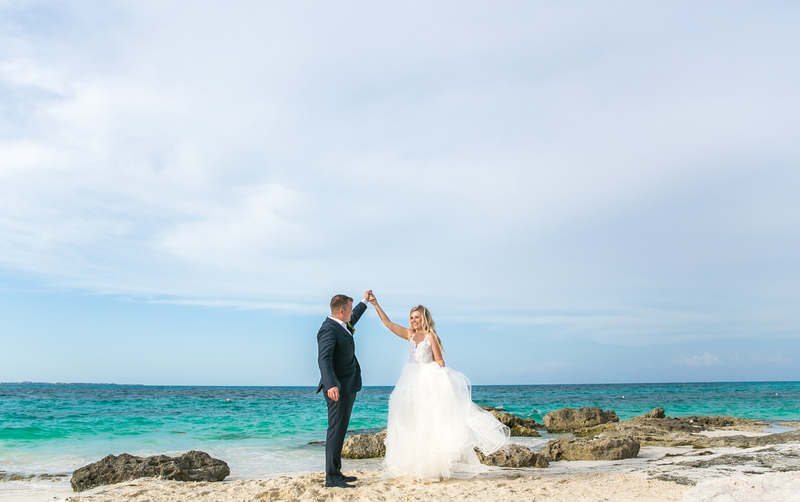 Friends and family from Canada and Scotland came together at their destination wedding in Cancun. Yet another sign of the times; it’s a small world after all! Iona went into a bridal boutique with a photo of her dream beach wedding dress thinking that it was a long shot, but it turned out they had the exact same dress! As soon as she tried it on, she knew it was the one. Iona envisioned an elegant beach wedding, oozing with her favorite color: Pink! She incorporated simple hints of white and gold to complete the theme. The bride and groom agree that the best moment of the day was seeing each other smile as Iona walked down the aisle. And the whole day was picture perfect, going off without a hitch. What advice does Iona have for brides-to-be getting married on the beach? I was told sooooo many times that THINGS WILL GO WRONG and it’s just not worth stressing over. The day goes by SO fast and anything that you think is the end of the world in that moment, I can assure you it’s not. Especially destination weddings where you can’t be there to plan and the language barrier, it’s bound to happen! Iona and Travis, it has been such a pleasure sharing your wedding adventure, and we hope that you will smile at each other every day in your marriage as you did on your wedding day. Congratulations! If you are looking for the best Riviera Maya wedding photographer for your beach wedding, then contact us now! We are Fun In The Sun Weddings, for the best Riviera Maya wedding photography. Want to know more about the Riu Cancun? Read unbiased reviews on Tripadvisor here. Photography is one of the biggest decisions to make for your wedding, especially for destination. As soon as I saw Marc's work featured on a wedding planners website I knew we had to have him. From the beginning, the process was unlike anything we've ever experienced. Marc and Gillian were so attentive - answering all questions we had and making sure all the details were taken care of before our big day. On the day Marc arrived and I was instantly at ease he was funny, took control and made the process so care free and fun as it should be! Every guest commented on how attentive he/his assistant were to the details and how friendly they were stopping to chat to all guests despite how busy they were. I would recommend this amazing company to anyone we are beyond happy with everything!